Author: Gast�n Boero, Fernando Fabiano and Sylvia Perossio. Rock, granite and the horizon are the main components of this art piece, seen from the river-side boulevard in Montevideo, where it stands close to the Parque de las Instrucciones, current home to the Uruguay Golf Club. A pink granite wall of modest height extends parallel to the boulevard, in an extension of roughly 120 meters, to be interrupted in its central area by a "window-hole" that opens towards the sea. Upon approaching the monument one can see rail tracks that reference the road without return towards extermination camps. These tracks suggest the beginning of a descending path through a ramp that reaches a wall that may evoke the Wailing/Western Wall, a strong symbol of world Jewry. The angles in the memorial's geometry seen on its pavement and walls contrast with the orthogonality of its environment, causing a changing game of lights and shadows that produce a dramatic effect. Two narrow wooden bridges take you from this point of uncertainty to the Meditation Square, where several stelae contain inscriptions of Biblical text and quotes from Jewish thinkers. One of them carries the signature of Romanian writer Elie Wiesel (1986 Nobel Peace Prize) and claims that sadness should be accompanied by hope. 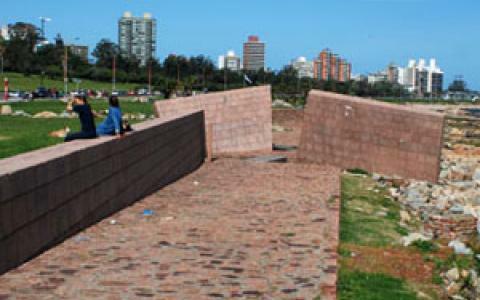 The genocide perpetrated by the Nazis during World War II (1939-1945) led the Jewish community of Uruguay and Uruguayan national authorities to build this memorial to commemorate the victims. The Holocaust was the systematic persecution and extermination of approximately six million Jews by the Nazi regime and its collaborators. The Nazis, who came to power in Germany in January 1933, believed Germans were a "superior race" and that Jews, considered to be "inferior", were a foreign threat to the German racial community. During the Holocaust period, German authorities persecuted other groups due to their perceived "racial inferiority": Gypsies, disabled people and some Slavic nations (Poles and Russians, among others). Other groups were persecuted for political, ideological and behavioural reasons, namely communists, socialists, Jehova's witnesses, homosexuals, and others.